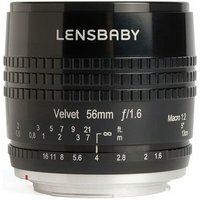 The Lensbaby Velvet 56mm f1.6 manual focus lens is great for portraiture and macro work and delivers a soft, velvety look at larger apertures, and beautifully sharp but subtly unique images as you stop down. The lens' classic portrait focal length combined with its unique f1.6 bright aperture, 1:2 macro capabilities and film, dream-like effects will expand the creative vision of macro and portrait photographers alike. This old-fashioned lens features an all-metal body, a beautiful clear-anodised finish, along with engraved aperture and focus markings.